Recently we have been reviewing lots of the best literacy products around for children. One of the great products Mr Z tried out is the Hot Dots High Frequency Words Card Set from Learning Resources. This is the first time we have tried a Hot Dots product, and Mr Z really enjoyed working with it. The set includes 40 double sided cards, which feature over 300 of the most commonly occurring words in the English language. These high frequency words are key for beginner readers to master as it will help to boost their confidence in reading by being able to recognise them. The set must be used with the hot dots pen, which is sold separately. 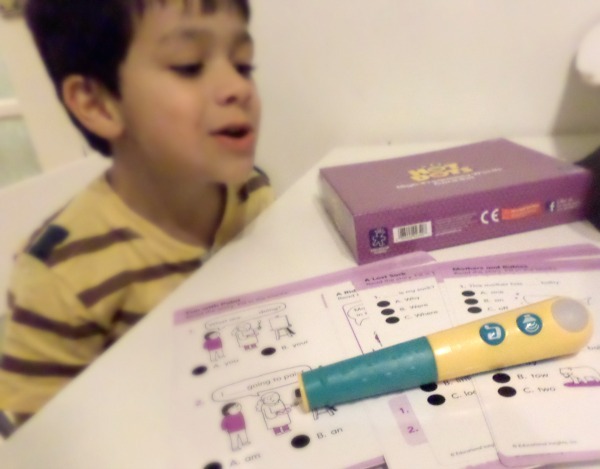 The pen gives verbal and visual (green or red light) feedback instantly, allowing the child to self correct their answers. 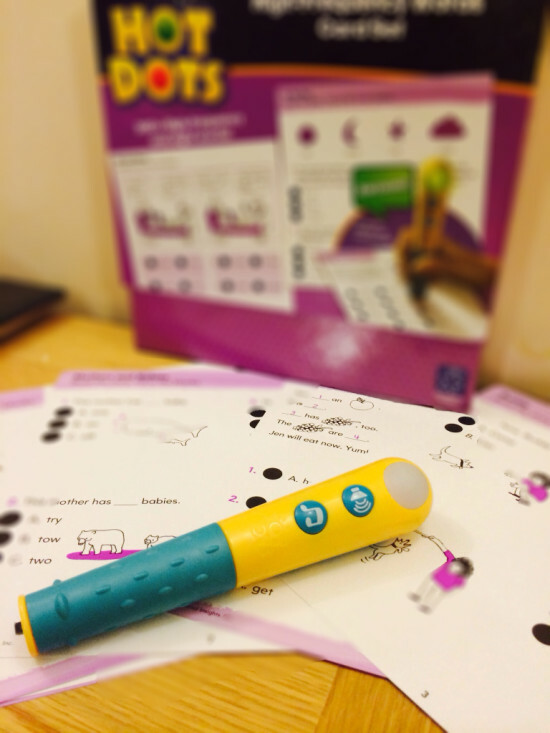 The talking hot dots pen requires 2x AAA batteries to work. Each card has 4 questions on each side, which involve reading a small passage and then answering questions. This was perfect for Mr Z at age 5. The cards are recommended for age 5-9 years but this could vary slightly depending on ability. I felt the level was just right as the questions were manageable for Mr Z but did make him think. The set of cards comes in a handy storage box, which also fits the Hot Dots pen in to store easily. I’ve always been happy with products from Learning Resources and this set is no exception. It’s a really handy resource to have at home, especially as all the cards are reusable so Mr Z can practise as many times as he needs and then once he has finished we can pass them down to Mr T and Mr R.
Have you used any Hot Dots products before? There is a massive selection on Learning Resources with some Jr ones for learning phonics and some more challenging ones which Mr Z could move on to once he has finished with these. There are sets for maths too, not only for literacy. You can see them all here. Let me know your thoughts and experiences with Hot Dots in the comments! This looks great, we have the hot dots pen with some maths books and they are great for learning. A fun and different way to learn! Looks like a great way to motivate children who might be reluctant to work on reading comprehension. What an interesting idea – looks great! I have never come across these before. I have to say that we just read lots of books with and too our boys and never focussed on learning at home. Jen aka The Mad House recently posted…Something for the half-term holidays â let your kids become an Animal Champion! Interesting idea. Not sure if my daughter is too young yet but it may be something we look at in a few years. I’ve never heard of these before but they sound interesting. I love this – my little boy would have loved this when he was at the beginner stages of learning. ANything that helps children to learn while having fun is a good thing! [email protected] recently posted…Get outside and have some family fun…. What an interesting sounding product! I didnt even know this kind of thing existed! Looking forward to when she’s old enough to be able to do things like this with her! These look fab for my for year old, we are smack bang in the middle of phonics at the mo! This looks like a great set of products. I’d really like to try it with JD.